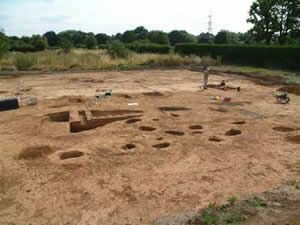 In May 2004 the Surrey County Archaeological Unit (SCAU) started a programme of archaeological fieldwork in advance of the redevelopment of the Painesfield Allotment site at Eastworth Road, Chertsey. SCAU initially carried out an archaeological evaluation at the site following a recommendation made by the preliminary archaeological assessment (undertaken by SCAU), which identified the archaeological potential of the site as moderate to good. The archaeological evaluation involved the excavation of fourteen trial trenches, five of which revealed features of archaeological interest, including five pits that were assigned a Middle Bronze Age date (c1500BC), and a small pit of probable Iron Age date. It was recommended that the central area of the site, where the Middle Bronze Age features were identified, be the subject of further archaeological excavation. It was also recommended that a watching brief be undertaken at the southern end of the development area where the probable Iron Age pit was identified. In July 2004 SCAU returned to the site in order to undertake the archaeological excavation in the central part of the site. An area c45m x 30m was stripped of the overburden and revealed a small Middle Bronze Age site with numerous features including pits, ditches and a waterhole, but with no evidence for any buildings. Despite the small size of the Bronze Age site, an unusually large number of artefacts were recovered; including a complete bucket urn with a cordon of finger impressed decoration, a hearth with evidence for carbonised seeds and grain, and various struck flint tools and struck flint waste flakes (some of which may be of earlier, Neolithic date). The artefacts are in the process of being washed and identified at the SCAU offices and the excavation report can then be prepared. Undoubtedly, further interesting details about the site will emerge as this work is undertaken. The archaeological watching brief of the southern part of the site will be undertaken when the site contractors, Countryside Properties, commence site works. The archaeological work carried out at the Painesfield Allotments site has provided a valuable insight into the Middle Bronze Age settlement of the Chertsey area, and has made an important contribution to our archaeological knowledge of the area.